Animal welfare groups are calling for live calf exports from Scotland to be banned following a BBC investigation. About 5,000 calves were shipped to Europe last year from Scotland yet none were exported from England. The investigation found most calves were taken to Catalonia in Spain, at just three weeks old, to be fattened before slaughter. They cannot join the milking herd so the unweaned and unwanted bull calves face being shot or shipped abroad - mostly to Spain and less often to Italy. 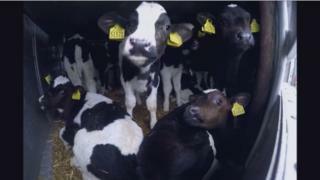 The Disclosure team learned that calves are being exported via the port of Cairnryan in Dumfries and Galloway. The ferry from Cairnryan travels to Larne in Northern Ireland. Livestock is then taken to Rosslare or Dublin in the Republic of Ireland for onward shipment to the continent. Scotland is central to the trade in calves because elsewhere in Britain the ferry companies refuse to carry animals for slaughter and fattening. However, as long as exporters and hauliers abide by regulations governing the trade, the business is legal. Campaigners said subjecting calves to such long journeys was unnecessary and they should be reared for the beef market in Scotland. The National Farmers' Union Scotland said export was a better option than shooting them. The Scottish government said live export was an important option for the country's economy. The BBC Scotland Disclosure team's investigation is the first time the exact destination and age of the cattle has been established. The team tracked the animals to Spain using official journey logs obtained by campaign group Eyes on Animals. The company receiving the calves confirmed the animals were three weeks old on arrival in Spain. The journey takes six days, including rest breaks. Campaigners said that calves had yet to develop their immune systems and could not regulate their own temperature so were particularly vulnerable. Nicola Glen, of Eyes on Animals, said "These animals are babies and they are not adapted to cope with these sort of journeys. "The longer the journey, it's been proven scientifically, the more suffering is involved for those animals." The industry said the only other option for the animals was to shoot them at birth. That is because UK consumers largely reject eating veal and prefer beef cattle from older animals. Charlie Adam, livestock convener at NFU Scotland, said of the export: "I don't think we are particularly comfortable with it. "It certainly would be at the bottom of our list of wants for what we do with those calves. "But if we come down to the point where it's either that or shooting them, then it's marginally better." The UK government is currently consulting on whether to ban export for slaughter and fattening - the practice of rearing animals to be slaughtered later. 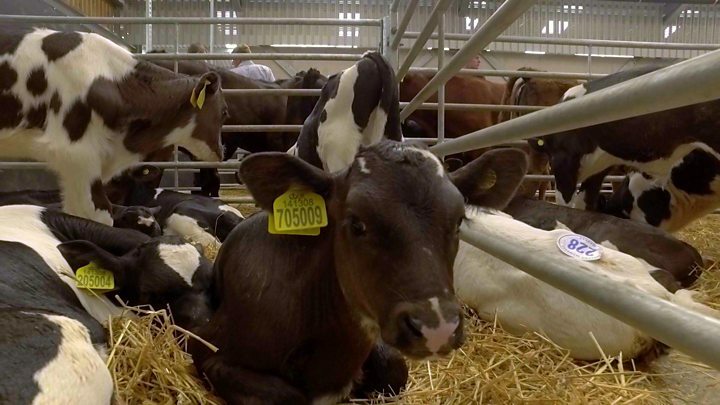 Currently, the only parts of the UK exporting dairy calves are Scotland and Northern Ireland. The Scottish government said it would take note of any changes in England but would not be bound by them. Rural Affairs minister Mairi Gougeon said: "Live animal transportation is something that is important for Scottish agriculture, it is important for our island communities, we just need to make sure that it is done as humanely as possible and that we uphold the highest possible standards in animals welfare." P&O Ferries carries the animals from Cairnryan to Larne, despite its own policy stating: "We are only prepared to ship breeding livestock, we will not ship any livestock intended for fattening or slaughter." When Disclosure contacted P&O about this apparent discrepancy, the company said: "P&O Ferries' operations adhere to its stated rule that it does not transport livestock for slaughter or fattening, and cooperates with the Scottish government on the shipping of livestock from Cairnryan to Larne for onward transportation to the continent." Peter Stevenson, of Compassion in World Farming, said: "Now that a substantial trade has developed in calves going from Scotland via NI and ROI to the continent, P&O should adopt a policy of only carrying animals from Scotland to NI if the transporter is able to provide evidence that the animals' final destination is in NI but not take them if they are, like these calves, being transported to the continent." If you want to speak to BBC Scotland Disclosure about this investigation, or another story, follow the team on Twitter @BBCDislosure. And remember, you can watch this Disclosure investigation on demand on BBC iPlayer.